The Louvre Museum is primarily known today for its astoundingly rich collection of paintings, sculptures, drawings and other, mostly European, cultural artifacts. But before it became one of the world's largest and most impressive art collections, it held a much different function. The Parisian museum now visited by millions of people each year was, until fairly recently, a royal palace and a crucial part of the fortifications that protected early medieval Paris from invaders. To really appreciate this historic site, learn more about its complex history ahead of your visit. These are the key facts and events to take away about the site. 1190: King Philippe Auguste builds a massive fortress on the site of the current-day Louvre in an effort to protect the cité from invaders. The fortress is constructed around four large moats and defensive towers. An enormous keep, referred to as the Grosse tour, stood at the center. The lower levels of this fortress are all that remain; they can be partially visited today. 1356-1358: Following another period of sprawl, Paris now extends far past the original fortified wall built in the 12th century. A new wall is built in part to serve as defense amid the onset of the Hundred Years' War against England. The Louvre no longer serves as a site of defense. 1364: The Louvre has ceased to serve its original purpose, prompting an architect working for King Charles V to reconvert the former fortress into a lavish royal palace. The medieval guise of the palace featured a prominent spiral staircase and a "pleasure garden", while the interiors were decorated with tapestries and sculpture. 1527: The Louvre remains unoccupied for 100 years or so after the death of King Charles VI. In 1527, Francois I moves in and entirely demolishes the medieval keep. The Louvre moves into its Renaissance guise. 1546: Francois I continues to transform the palace in accordance with Renaissance architectural and design trends, eradicating the medieval west wing and replacing it with Renaissance-style structures. Under the reign of Henri II, the Hall of The Caryatids and the Pavillon du Roi (King's Pavillion) are constructed, and include the king's private quarters. The decoration of the new palace is finally completed under the orders of King Henri IV. Mid 16th-century: The Italian-born French Queen Catherine de' Medici, widow to Henri II, orders the construction of the Tuileries Palace in an effort to improve comfort levels at the Louvre, which is by historical accounts a chaotic, smelly place. This particular set of plans is eventually abandoned for another. 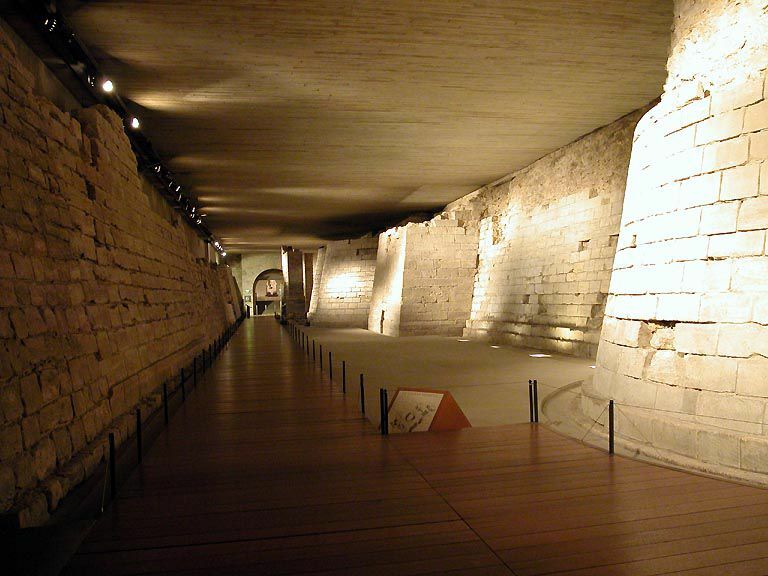 1595-1610: Henri IV builds the Galerie du Bord de l'Eau (Waterside Gallery) to create a direct passageway from the Louvre's royal quarters to the nearby Tuileries Palace. The area known as the Galerie des Rois (Kings' Gallery) is also constructed during this time. 1624-1672: Under the reign of Louis XIII and Louis XIV, the Louvre undergoes an intensive series of renovations, resulting in the palace we recognize today. Major additions during this period include the Pavillon de l'Horloge (Clock Pavilion) which is today called the Pavillon de Sully and would serve as a model for the design of the other pavilions which make up the modern-day site. The sumptuous Apollo Gallery is completed in 1664. 1672-1674: The monarch Louis XIV moves the seat of royal power to the Palais de Versailles in the countryside. The Louvre falls into a state of relative neglect for a century. 1692: The Louvre has a new role as a meeting place for artistic and intellectual "salons", and Louis XIV orders the establishment of a gallery for antique sculptures. This was the first step toward the birth of the world's most-frequented museum. 1791: Following the French Revolution of 1789, the Louvre and the Tuileries are temporarily re-imagined as a national palace to "gather monuments of the sciences and arts". 1793: The revolutionary French government opens the Muséum Central des Arts de la République, a new public institution that in many ways precedes the modern-day concept of the museum. Admission is free for all, while the collections are primarily drawn from the seized possessions of French royalty and aristocratic families. 1798-1815: The future Emperor Napoleon I "enriches" the collections at the Louvre through spoils acquired during his conquests abroad, and particularly from Italy. The museum is renamed the Musée Napoleon in 1803 and a bust of the emperor is placed over the entrance. In 1806, the Emperor's architects Percier and Fontaine build a small "Arc de Triomphe" on the central pavilion of the Tuileries in celebration of France's military conquests. The arch originally includes four antique bronze horses that had been taken from St Mark's Basilica in Italy; these are restored to Italy in 1815 when the First Empire falls. During this period, the Louvre is also significantly expanded to include many of the wings still present today, including the Cour Carré and the Grande Galerie. 1824: The Modern Sculpture Museum is opened in the west wing of the "Cour Carré". The museum included sculptures from Versailles and other collections, across a mere five rooms. 1826-1862: As modern curating techniques and trading develop, the Louvre's collections are significantly enriched and expanded to include works from foreign civilizations. From Egyptian and Assyrian antiquities to medieval and Renaissance art and contemporary Spanish painting, the Louvre is well on its way to becoming a behemoth center of arts and culture. 1863: The Louvre's now-massive collection is rechristened the Musée Napoleon III in honor of the leader of the Second Empire. The collections' expansion is mainly due to the 1861 acquisition of over 11,000 paintings, objets d'art, sculptures and other objects from the Marquis Campana. 1871: In the heat of the popular revolt of 1871 known as the Paris Commune, the Tuileries Palace is burned by the "Communards." The palace is never restored, leaving only the gardens and isolated buildings. To this day, at least one French national committee continues to petition for the restoration of the Palace. The next period in the history of this iconic French site brings further changes and upheavals, beginning with the destruction of the old Tuileries Palace. 1883: When the Tuileries Palace is torn down, a major transition occurs and the Louvre ceases to be a seat of royal power. The site is now almost entirely dedicated to the arts and culture. Within a few years, the museum would expand significantly to take over all of the major buildings. 1884-1939: The Louvre continues to expand and inaugurates innumerable new wings and collections, including a wing dedicated to the Islamic arts and the Musée des Arts Decoratifs. 1939-1945: With the impending breakout of World War II in 1939, the museum is closed and the collections evacuated, excepting the largest pieces which are protected by sandbags. When Nazi troops invade Paris and most of France in 1940, the Louvre re-opens, but is mostly empty. 1981: French President Francois Mittérand unveils an ambitious plan to renovate and reorganize the Louvre and move the only remaining government ministry to another location, making the Louvre exclusively dedicated to its activity as a museum for the first time. 1986: The Musée d'Orsay is inaugurated in the former locale of the Orsay train station across the Seine. The new museum transfers more contemporary works from artists born between 1820 and 1870, and soon sets itself apart for its collection of Impressionist painting, among others. Works from the Jeu de Paume on the west end of the Tuileries are also transferred to Orsay. 1989: The Louvre's glass pyramid built by Chinese architect I.M. Pei is inaugurated and serves as the new main entrance.